It is barely credible that only two decades ago geoscientists who argued that extraterrestrial impacts had once had an important role in Earth history met with scorn from many of their peers; slightly mad, even bad and perhaps dangerous to know. Yet clear evidence for impacts has grown steadily, especially in the time before 2.5 billion years ago known as the Archaean (see EPN for March 2003 , April 2005, July 2012 , May 2014). Even in the 1990s, when it should have been clear from the golden years of lunar exploration that our neighbour had been battered at the outset of the Archaean, claims for terrestrial evidence of the tail-end of that cataclysmic event were eyed askance. Now, one of the pioneer researchers into the oldest terrestrial impacts, Don Lowe of Stanford University, California has, with two colleagues, reported finds of yet more impact-related spherule beds from the famous Archaean repository of the Barberton Mountains in South Africa (Lowe, D.R. et al. 2014. Recently discovered 3.42-3.23 Ga impact layers, Barberton Belt, South Africa: 3.8 Ga detrital zircons, Archaean impact history and tectonic implications. Geology, v. 42, p. 747-750). Like four other such layers at Barberton, those newly described contain several types of spherules, degraded to microcrystalline alteration products of the original glasses. Some of them contain clear evidence of originally molten droplets having welded together on deposition. Their contrasted geochemistry reveals target rocks ranging in composition from well-sorted quartz sands to intermediate, mafic and ultramafic igneous rocks. Some beds are overlain by chaotic deposits familiar from more recent times as products of tsunamis, with signs that the spherules themselves had been picked up and transported. Dated by their stratigraphic relations to local felsic igneous rocks, the spherule beds arrived in pulses over a period of about 240 Ma between 3.42 to 3.23 Ga. Even more interesting, the overlying tsunami beds have yielded transported zircons that extend back to 3.8 Ga spanning the Archaean history of the Kaapvaal craton of which the Barberton greenstone belt rests and indeed that of many Eoarchaean cratons; the Earth’s oldest tangible continental crust. The zircons may reflect the depth to which the impacts penetrated, possibly the base of the continental crust. It isn’t easy to judge the size of the responsible impactors from the available evidence, but Lowe and colleagues suggest that they were much larger than that which closed the Mesozoic at the Cretaceous-Palaeogene boundary; perhaps of the order of 20-70 km across. So, although the late, heavy bombardment of the Moon seems to have closed at around 3.8 Ga, from evidence yielded by the Apollo programme, until at least half a billion years later large objects continued to hit the Earth more often than expected from the lunar record. Lowe has suggested that this tail-end of major bombardment on Earth may eventually have triggered the onset of plate tectonics as we know it now. The relationship between Earth’s complement of free oxygen and life seems to have begun in the Archaean, but it presented a series of paradoxes: produced by photosynthetic organisms oxygen would have been toxic to most other Archaean life forms; its presence drew an important micronutrient, dissolved iron-2, from sea water by precipitation of iron-3 oxides; though produced in seawater there is no evidence until about 2.4 Ga for its presence in the air. It has long been thought that the paradoxes may have been resolved by oxygen being produced in isolated patches, or ‘oases’ on the Archaean sea floor, where early blue-green bacteria evolved and thrived. A stratigraphic clue to the former presence of such oxygen factories is itself quite convoluted. The precipitation of calcium carbonates and therefore the presence of limestones in sedimentary sequences are suppressed by dissolved iron-2: the presence of Fe2+ ions would favour the removal of bicarbonate ions from seawater by formation of ferrous carbonate that is less soluble than calcium carbonate. Canadian and US geochemists studied one of the thickest Archaean limestone sequences, dated at around 2.8 Ga, in the wonderfully named Wabigoon Subprovince of the Canadian Shield which is full of stromatolites, bulbous laminated masses probably formed from bacterial biofilms in shallow water (Riding, R. et al. 2014. Identification of an Archean marine oxygen oasis. Precambrian Research, v. 251, p. 232-237). Limestones from the sequence that stable isotope analyses show to remain unaltered all have abnormally low cerium concentrations relative to the other rare-earth elements. Unaltered limestones from stromatolite-free, deep water limestones show no such negative Ce anomaly. Cerium is the only rare-earth element that has a possible 4+ valence state as well one with lower positive charge. So in the presence of oxygen cerium can form an insoluble oxide and thus be removed from solution. So cerium independently shows that the shallow water limestones formed in seawater that contained free oxygen. Nor was it an ephemeral condition, for the anomalies persist through half a kilometer of limestone. The study shows that anomalous oxygenated patches existed on the Archaean sea floor, probably shallow-water basins or shelves isolated by the build up of stromatolite reef barriers. For most prokaryote cells they would have harboured toxic conditions, presenting them with severe chemical stress. Possibly these were the first places where oxygen defence measures evolved, that eventually led to more complex eukaryote cells that not only survive oxygen stress but thrive on its presence. That conjecture is unlikely to be fully proved, since the first undoubted fossils of eukaryote cells, known as acritarchs, occur in rocks that are more than 800 Ma years younger. From the days when advocates of impacts by extraterrestrial objects as explanations of geological features were widely regarded as ‘whizz-bang artistes’ a great many hats have probably been eaten, albeit in closely guarded privacy. In 1986, when beds of glassy spherules similar to those found in lunar soil and in the K-T boundary sequence were reported from early Archaean greenstone belts in Australia and South Africa, and deduced to have formed by an impact, the authors, Donald Lowe of Stanford University, USA and colleagues, were pounced on by those who thought they could plausibly explain the very odd rocks by unremarkable, Earthly processes. Subsequent work on their geochemistry overwhelmingly supported their formation by an impact of a large carbonaceous chondrite asteroid. And at one site, the Barberton Mountain Land greenstone belt in northeastern South Africa, there was evidence for at least three such impacts formed in a 20 Ma period. In hindsight, given the lunar bombardment history that peaked between 4 and 3.8 Ga, early Archaean rocks were a great deal more likely to contain materials formed by giant impacts than less antiquated ones. Lowe has been steadily working on his original idea since then, his enthusiasm drawing in others. The latest focus is on evidence for other likely consequences in the Archaean record of the vast power unleashed by incoming asteroids travelling at speeds around 15 km s-1 (Sleep, N.H. & Lowe, D.R. 2014. Physics of crustal fracturing and chertdike formation triggered by asteroid impact, ~3.26 Ga, Barbertongreenstone belt, South Africa. Geochemistry, Geophysics, Geosystems, v. 15, doi:10.1002/2014GC005229). The damage at Barberton not only produced spherule beds but opened fractures on the shallow sea bed into which liquefied sediments, including some spherules, were injected. These swarms of up to 10 m wide cherty dykes extend up to 100 m below what was then the sea floor strewn with impact spherules, and contain evidence of successive pulses of sediment injection. Sleep and Lowe explain these dyke swarms as fractures caused by seismicity associated with a major impact. Their complexity suggests extreme shaking for upwards of 100 seconds; far longer than that from large, tectonic earthquakes. The fact that cracks opened to accommodate the sedimentary dykes indicates extension of the affected crust, which the authors suggest resulted from gravitational sliding of the shocked surface sediments down a gentle slope. Possibly the sediments, including the direct products of impact, the spherules, were swept into the cracks by currents associated with tsunamis induced by the impact. Interestingly, the spherules and dykes formed upon crust largely formed of mafic to ultramafic lavas, yet volcanism following close on the heels of the impact event was of felsic composition. Did the impact trigger a shift locally from oceanic magmatism to that characteristic of island arcs; that is, did it start a new subduction zone? When continents first appeared; the pace at which they grew; the tectonic and magmatic processes responsible for continental crust, and whether or not crustal material is consumed by the mantle to any great extent have been tough issues for geologists and geochemists to ponder on for the last four decades. Clearly, continental material was rare if not absent in the earliest days of the solid Earth, otherwise Hadean crust should have been found by now. Despite the hints at some differentiated, high silica rocks that may have hosted >4 billion-year old zircon crystals from much younger sediments, the oldest tangible crust – the Acasta Gneiss of northern Canada – just breaks the 4 Ga barrier: half a billion years short of the known age of the Earth (http://earth-pages.co.uk/2008/11/01/at-last-4-0-ga-barrier-broken/). Radiometric ages for crustal rocks steadily accumulated following what was in the early 1970s the astonishing discovery by Stephen Moorbath and colleagues at Oxford University and the Geological Survey of Greenland of a 3.8 billion year age for gneisses from West Greenland. For a while it seemed as if there had been great pulses that formed new crust, such as one between 2.8 and 2.5 Ga (the Neoarchaean) separated by quieter episodes. Yet dividing genuinely new material coming from the mantle from older crust that later thermal and tectonic events had reworked and remelted required – and still does – lengthy and expensive radiometric analysis of rock samples with different original complements of radioactive isotopes. One approach to dating has been to separate tiny grains of zircon from igneous and metamorphic rocks and date them using the U-Pb method as a route to the age at which the rock formed, but that too was slow and costly. Yet zircons, being among the most intransigent of Earth materials, end up in younger sedimentary rocks after their parents have been weathered and eroded. It was an investigation of what earlier history a sediment’s zircons might yield that lead to the discovery of grains almost as old as the Earth itself (http://earth-pages.co.uk/2011/12/21/mistaken-conclusions-from-earths-oldest-materials/ http://earth-pages.co.uk/2005/05/01/zircon-and-the-quest-for-life%E2%80%99s-origin/). That approach is beginning to pay dividends as regards resolving crustal history as a whole. Almost 7000 detrital zircon grains separated from sediments have been precisely dated using lead and hafnium isotopes. Using the age distribution alone suggests that the bulk of continental crust formed in the Precambrian, between 3 and 1 Ga ago, at a faster rate than it formed during the Phanerozoic. However, that assumes that a zircon’s radiometric age signifies the time of separation from the mantle of the magmas from which the grain crystallised. Yet other dating methods have shown that zircon-bearing magmas also form when old crust is remelted, and so it is important to find a means of distinguishing zircons from entirely new blocks of crust and those which result from crustal reworking. It turns out that zircons from mantle-derived crust have different oxygen isotope compositions from those which crystallised from remelted crust. Bruno Dhuime and colleagues from St.Andrew’s and Bristol universities in the UK measures hafnium model ages and δ18O values in a sample of almost 1400 detrital zircons collected across the world from sediments of different ages (Dhuime, B. et al. 2012. A change in the geodynamics of continental growth 3 billion years ago. Science, v. 335, p. 1334-1336). Plotting δ18O against Hf model age reveals two things: there are more zircons from reworked crust than from mantle-derived materials; plotting the proportion of new crust ages to those of reworked crust form 100 Ma intervals through geological time reveals dramatic changes in the relative amounts of ‘mantle-new’ crust being produced. Before 3 Ga about three quarters of all continental crust emerged directly from the mantle. Instead of the period from 3 to 1 Ga being one of massive growth in the volume of the crust, apparently the production rate of new crust fell to about a fifth of all crust in each 100 Ma time span by around 2 Ga and then rose to reach almost 100% in the Mesozoic and Cenozoic. This suggests that the late Archaean and most of the Proterozoic were characterised by repeated reworking of earlier crust, perhaps associated with the repeated formation and break-up of supercontinents by collision orogeny and then tectonic break up and continental drift. 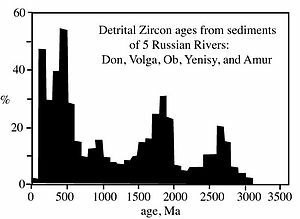 Dhuine and colleagues then use the record of varying new crust proportions to ‘correct’ the much larger database of detrital zircon ages. What emerges is a well-defined pattern in the rate of crustal growth through time. In the Hadean and early Archaean the net growth of the continents was 3.0 km3 yr-1, whereas throughout later time this suddenly fell to and remained at 0.8 km3 yr-1. Their explanation is that the Earth only came to be dominated by plate tectonic processes mainly driven by slab-pull at subduction zones after 3 Ga. Subduction not only produces mantle-derived magmas but inevitably allows continents to drift and collide, thereby leading to massive deformation and thermal reworking of older crust in orogenic belts and an apparent peak in zircon ages. The greater rate of new crust generation before 3 Ga may therefore have been due to other tectonic processes than the familiar dominance of subduction. Yet, since there is convincing evidence for subduction in a few ancient crustal blocks, such as west Greenland and around Hudson’s Bay in NE Canada, plate tectonics must have existed but was overwhelmed perhaps by processes more directly linked to mantle plumes.